Mike Regan finds himself in a deadly, high-stakes game of cat-and-mouse when his I.T. consultant uses his skills to stalk Mike’s daughter and endanger his family, his business, and his life. If I tended toward cheap jokes, I’d state that 2016’s IT offers the long-awaited sequel to 1982’s classic ET the Extraterrestrial. But I’d never make a crack that terrible. Mike Regan (Pierce Brosnan) runs a successful aviation business and enjoys a happy home life with wife Rose (Anna Friel) and 17-year-old daughter Kaitlyn (Stefanie Scott). Mike also owns a fancy-pants “smart home” with all the latest technological conveniences. These choices come back to haunt Mike. 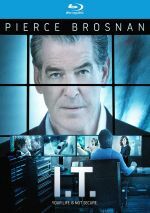 IT consultant Ed (James Frecheville) develops an unhealthy obsession with his boss and uses his tech skills to stalk and endanger the Regans. A straight-to-video affair, I doubt I ever would have heard of IT if I didn’t run this site. When the press release hit my inbox, though, I thought it sounded interesting, so I decided to give it a look. I do that a lot, and it occasionally gets me into trouble, as I wind up stuck with some crap movies. Will I add IT to that list? No, but it’s closer to “bad” than to “good”. IT comes as part of the “psycho stalker” genre, and it does little to make a name for itself. We’ve seen scores of this sort of movie: new acquaintance feels wronged and fixates on subject of scorn to get revenge. Fatal Attraction, Cape Fear, and so on – the list of films under this banner goes on endlessly. Too many of these efforts telegraph the antagonist’s psychological problems too early, and IT suffers from that same mistake. Sure, one could argue that the movie doesn’t need to draw out the suspense in that regard, as the filmmakers know the viewer probably saw the trailer/read a synopsis and expects the villain to go bonkers. That doesn’t mean the movie should cater to those audience preconceptions, though, especially because the decision to reveal a character’s mental issues too early creates ancillary problems. When the viewer learns of this extreme nuttiness, it becomes tougher to accept that the characters affected by this person don’t pick up on these quirks. And so it goes during IT. Ed seems “off” pretty much out of the gate, so the audience wonders why the characters don’t notice these tendencies. Because we question their perceptions, we don’t care about what happens to them – we think the affected parties should be smarter and feel less sympathy when the inevitable problems evolve. Even if IT lacked the standard “creepy guy” buildup for Ed, it would remain ordinary, though I think parts of the premise show potential. The film reminds us how deep in our lives “smart technology” runs – and how easily someone could pervert those gadgets. If IT had been a better movie, it could’ve done for interactive technology what Jaws did for swimming in the ocean. But it’s not an especially effective tale, as it relies too much on leaps of logic and hoary thriller clichés. A few of these still produce tension – especially when Mike infiltrates Ed’s lair – but none of these techniques ever feels fresh or creative. That leaves us with a mediocre thriller. IT offers enough zing to ensure it keeps us with it for its 95 minutes, but it fails to create anything especially provocative or memorable. IT appears in an aspect ratio of approximately 2.35:1 on this Blu-ray Disc. This was a good but not great presentation. Sharpness was usually fine. A little softness occasionally interfered – mainly during interiors - but those instances occurred infrequently. The majority of the movie appeared concise and accurate. No issues with jaggies or shimmering occurred, and I saw no edge haloes or print flaws. Like many modern thrillers, IT went with a palette that favored teal tones. It veered yellow at times but the blue overlay remained dominant. Despite that, the colors remained appropriate. Blacks seemed fairly deep and tight as well, and shadows showed reasonable clarity. This became a pretty good image. I thought the DTS-HD MA 5.1 soundtrack worked fine for the material. Much of the film remained chatty, but occasional action-oriented sequences opened it up a bit, and a rainstorm used the channels in a satisfying manner. Music also showed appropriate stereo presence as well. The soundscape wasn’t great, but it seemed adequate. Audio quality was positive. Speech sounded natural and concise, without edginess or other issues. Music showed good range and heft, while effects were acceptably accurate and clear. This never became a memorable mix, but it was more than sufficient for the story. A featurette called Behind the Scenes of IT runs eight minutes, six seconds. It includes notes from actors Pierce Brosnan, James Frecheville, and Anna Friel. We learn about story/characters, cast and performances and the work of director John Moore. Superficial in nature, “Scenes” tells us little about the film. Within a Photo Gallery, we find 14 stills. These depict images from the movie and aren’t very exciting. I will the quality of their reproduction though, as they fill the entire TV screen and look great. The disc opens with ads for Criminal Activities, Rage, Devil’s Knot and The Numbers Station. No trailer for IT appears here. As an entry in the “psycho stalker” genre, IT seems passable and no more. While it throws out good performances and a few tense moments, it remains far too trite and predictable. 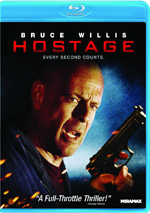 The Blu-ray presents mostly positive picture and audio but lacks notable supplements. Nothing about IT stands out as memorable.